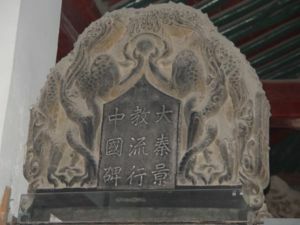 Xian (西安 Xī'ān, pron. SEE-ahn), is a historic city in Shaanxi Province in China. Xi'an is more than 3,000 years old and was known as Chang'an (长安) in ancient times. For 1,000 years, the city was the capital for 13 dynasties, and a total of 73 emperors ruled here. Xi'an is the undisputed root of Chinese civilization having served as the capital city for the Zhou, Qin, Han, Sui and Tang dynasties. With so much history within the ground the city lies upon, it is no wonder that there are so many historical ruins, museums and cultural relics to be found here. It was already influencing the world outside of the Great Wall of China as the eastern terminus of the Silk Road（丝绸之路). Here traders from far and wide brought goods and ideas for sale and took goods and ideas back with them to their native countries. In present day Xi'an not much of its former glory remains within the city confines, due to the constant warfare and political changes that swept China particularly throughout the 20th Century. Today the city has a pleasant cosmopolitan flair to it and it is worth visiting for the famed Terracotta Warriors alone. It has often been said that, "if you have not been to Xi'an, you have not been to China!" Xi'an has most of its annual precipitation from August to late October in the form of rain. It is characterised by hot summers and cold, dry winters. Spring and autumn will be somewhat brief and dry. Xi'an Xianyang International Airport (IATA: XIY) is located 40 km (25 mi) northwest of the city centre, in Xianyang. Flights are available to Beijing, Chengdu, Chongqing, Dunhuang, Fuzhou, Guangzhou, Harbin, Hangzhou, Hohhot, Kunming, Lhasa, Lanzhou, Nanjing, Shanghai, Shenzhen, Urumqi, Wuhan, Xiamen, Xining and Zhangjiajie within Mainland China. International flights are available to Helsinki, San Francisco, Bangkok, Hong Kong, Macau, Seoul, Singapore,Kuala Lumpur as well as Nagoya, Fukuoka, Niigata, Tokyo and Hiroshima in Japan. As Xi'an is located in the heartland of China, it takes no more than 2 hours to fly to most major Chinese cities. The airport has three terminals. Terminal 2 and 3 are for domestic flights. The international flights depart from the terminal 2 near terminal 3. Most people use taxis or the airport bus to reach town from the airport, however taking a taxi is not recommended, as most taxi drivers will raise the price for non-local tourists. A taxi will cost about ¥150 from the airport to the Bell Tower downtown. You will pay around ¥ 50-75 more if you take one of the climatized Japanese-branded black taxis rather than the typical green taxis. At the airport, both types of taxis are waiting at the same spot to pick up passengers. The airport buses leaves traveling one of 6 routes, each every half-hour from 06:00 to 18:00. A ticket (which needs to be purchased beforehand at the counter inside the arrival terminal) costs ¥26 and the trip takes at least one hour; there are several lines but the most useful are Airport Bus No. 2 (to the railway station in front of Jiefang Hotel 解放饭店) and No. 1 (which used to run to the Bell Tower, but buses no longer run this centrally in the old town; of the two lines that run inside, one stops near the West Gate and the other near the East Gate). As long as there is an arriving flight, there will be a bus, so don't worry about arriving late at night or early morning; officially, on line 1 there is a bus every 20 minutes but buses will often depart as soon as they fill up. The airport bus route is the best way between city and the train station (where a veritable fleet of buses leave constantly to take tourists and locals to the Terracotta Warriors, among other places). There are also shared car services available which can drop you off directly at your hotel for around ¥60. Tickets are available from the same counter where the bus tickets are sold. Show the person at the counter your destination on the map and they will quote you the price, give you a ticket and walk you to your van. If you're a spur-of-the-moment traveller expecting to find enterprising, helpful people to greet you with options in English, you may be disappointed. Especially outside of high season, there are surprisingly few such freelancers. It's a good idea to book a tour in advance if you want to explore any but the most-beaten paths. Many tours will extend an airport pickup at a discounted cost (or, in some cases, at no cost). If you want to take a taxi to the Terracotta Warriors, for example, it may cost as much as ¥200 from the airport, and, with few drivers speaking English, the phrase Bing Ma Yong (Mandarin for "Terracotta Warriors") will come in quite handy. The high speed train from Xi'an North Station to Luoyang-Longmen is now available many times a day, starting from 07:00. The distance of 400 km (250 mi) takes about 90 minutes. The high speed train station is located about 10 km (6 mi) north from the Xi'an north gate (do not get it mixed up with the Xi'an North gate train station). The last train returns around 19:00. Schedules may change, so it is best to check it out at the station or website. Use the cheap and highly efficient subway to get to and from Xi'An central (¥3 as of September 2014, takes about 30 min). There are plenty of trains transporting passengers to and from most of the major cities inside China. Keep in mind during national holidays and peak travel periods, train tickets may available only if booked in advance (most ticket sales open 10-21 days in advance). Traveling in a seat (hard or soft-class) likely means a bargain price but may be accompanied by smokers, loud noise, and activity in the aisle while you try to sleep. Do not travel hard class if you are uncomfortable with these settings. Sleeper cabins are limited to 6 people each (4 for deluxe soft sleepers, which are typically only found on the trains originating from Beijing). If traveling alone, keep an eye on your luggage and practice common sense. Also note it's customary for bathrooms to close 30-60 minutes before getting to the final destination of that route. Trains run to several domestic cities including: Beijing (5-13 hours), Chengdu (13-18 hours), Chongqing (14 hours), Guangzhou (8–24 hours), Kunming (36-53 hours), Lanzhou (8-10 hours), Lhasa (36 hours), Shanghai (11-20 hours), Urumqi (31-56 hours), Wuhan (4-18 hours), and Zhengzhou (2–6 hours). Xi'an Station is at the north end of Jiefang Road (解放路; pinyin: jiěfànglù), just outside the northeast city wall. As you exit, there will probably be lots of people offering cheap hotel rooms; just ignore them if you already have a room booked. Even if you don't, you probably don't want to get one from them anyway. Also, don't fall for the people who offer to exchange a Xi'an map for your used train ticket - they reuse them for some shady purposes, e.g. re-selling them to people who just want to get into the station or try to sneak on a train. In Xi'an, it is very easy to get to the railway station by city bus from anywhere in the city. There are several stops within 200 m of the station (look for train station East or North on a bus route (火车站东/北). Bus 603 will take you into the city for only ¥1. Many hostels also offer free pick-up if you arrive between 06:00 and 09:00. Xi'an North Station serves the high-speed rail. It is connected by the metro system. Destinations include Luoyang, Zhengzhou, Wuhan, Shijiazhuang, Beijing, Shanghai, Nanjing, Changsha, Guangzhou and Shenzhen. If you want to take a taxi from the North Station, note that when you exit the station for the taxi stand, you will be greeted by a crowd of eager private drivers offering fake taxi rides. Ignore them and continue walking down the corridor until you reach the outside doors. The official taxis will be waiting for you. Xi'an South Station is a very remote railway station. The easiest way is to go to the southern-most stop on the subway, and then taking a taxi. Note however that even taxi drivers have a hard time finding this one. However, trains from this station will not sell out as fast, which might make this station the only one available for you. There are over-night trains to Pingyao and Taiyuan from here (leaving at around 17:00, and about 11-12h travel time) and also trains to far away locations such as Urumqi (38½ hours), Hohhot (15 hours), Kunming (32 hours), Guangzhou (24½ hours) and Chongqing (10 hours). The main long-distance bus station - Shaanxi Province Long-distance Bus Station is located approximately 100m south to the exit or entry to Xi'an railway station, immediately after you cross the city wall. Bus service is available to: Huashan (2-3 hours), Lanzhou (8-10 hours), Luoyang (5-7 hours), Pingyao (7-8 hours), Taiyuan (12 hours), and Zhengzhou (9-12 hours). If you are arriving from Pingyao by bus, you will most likely arrive at the east bus station. Catch the bus 203 right next to the bus station to get to the city centre. Traffic is heavy, right of way is unheard of, and the rule of thumb is "keep going no matter what" (although drivers do note red lights). The city is surrounded by a city wall, in its middle the Bell Tower (Chinese:钟楼; pinyin: Zhōnglóu). From this one, the four main streets descend into the four points of the compass. Do not get confused by different names in tourist guides, addresses and bus stops: Nandajie, Nanda-Street, South-Street, South-Avenue are all the same. Locals often speak about Within city walls and Outside city walls when talking about locations. Outside the walls, the southern part is the most interesting, it offers shopping streets, bars and some nightlife. There are plenty of buses departing everywhere in short-intervals (main lines every 5-10 minutes). If you are not confident enough with orientation, or if you do not like packed buses, the cheap taxis are the best alternative, broadly available, except for during rush hours. Line 2 runs north-south. You can connect to and from the Xi'an North Train Station (西安北客站; Xī'ān Běikezhàn) for the high-speed rail network. Line 1 runs east-west and crosses Line 2 at 北大街 (Bei Da Jie) in the city center. Line 3 runs roughly in the northeast-southwest direction and intersects with line 1 at 通化门 (Tong Hua Men) and line 2 at 小寨 (Xiao Zhai). Regular buses within the city cost ¥1 (¥2 for air-conditioned, marked with a snow-flake) no matter how far you go. Since there are many buses in the city, it can be useful to go to the Tourism Office Center (which is situated near the Bell Tower) and ask for a free map of the city, with the buses' lines on it. A popular line for tourists is #610 (also labeled "游8" in Chinese, which means "tourist #8") which connects the railway station, the Bell Tower, the Small Wild Goose Pagoda and Xi'an Museum, the Shaanxi Historic Museum and the Giant Wild Goose Pagoda. Unfortunately it is not one of the most frequent (sometimes you can wait for half an hour, though usually it comes in a few minutes). Near the Bell Tower, it stops at the beginning of West Street; take it westwards to then go south to the museums and pagodas, take it eastwards to then go north to the railway station. Near the railway station (there are many stops for different lines) you can catch it at the third block on the main street going straight south from the station. Another useful line is #609 that connects the Bell Tower, the South Gate and the Big Goose Pagoda. Near the Bell Tower, it stops at the beginning of South Street. Although the 609 and 610 can be infrequent, the 611 is very regular, and connects the train station and the Bell Tower. Look for it over the road from the station. There are many buses leaving regularly for the Terracotta Warrior museum in front of the Xi'an bus station (east to the train station, outside (in the north) the city walls). Bus 306 (Chinese bus green 5) leaves from the lot in front of the train station and will take you to a parking lot right in front of the museum site in about an hour (it can take up to 90 minutes in case of traffic jams). A one-way ticket costs ¥7 (just get on and sit down, then a conductor will come and give you a ticket). It also stops at another famous tourist attraction along the way, Huaqing Palace (华清宫). Make sure you don't make the mistake of going to the bus station on the inside of the wall near the train station. That's where there are touts with signs saying bus 5 and bus 306, trying to hustle you onto their private bus. Although they do take you to the destinations, you are forced to go to visit attractions you might not want to go to. If you're facing the train station directly, the lot where the bus departs from will be on your right - it's near a Dico's. Look out for a sign with a bunch of Chinese characters with 306 (5) in between them. Small buses which are used by the locals (e.g. number 914, ¥9 as of May 2015). These buses will also take you to the Museum however they go through local roads (no highway express like bus 306) therefore it will take slightly longer to arrive. Not a bad trip if you want to see some of the local area. Note: local bus 915 will take you to the museum site in about an hour as it takes the highway express too like the 306. The ride is not as comfortable as the 306 since the buses are often packed (with people even standing). Most hostels and hotels run tours to the warriors with an English speaking guide. These aren't necessarily better, be prepared to spend a good portion of the day (as with any Chinese tour) visiting "terracotta factories," "museums", "Chinese medicine shops", and other tourist traps. But, you will get to your destination without dealing with the bus (the warriors are quite far outside of town) and not all of the public buses that go there are legitimate. Watch the taxi drivers in Xi'an as the industry is not regulated as it is in other larger cities. You may find yourself being taken on a long ride around town to get where you are going. It can also be difficult to convince them to take you anywhere (even to the railway station). If in doubt get your hotel or hostel to write down the place you want to go in Chinese. Between 3 and 5 o'clock in the afternoon the taxis change their shifts. This means the drivers are rushing to their handover points, so they won't pick you up even if they are empty. Trips within the city walls are generally around ¥10, longer trips to the attractions south of the city are ¥12-20. Especially when you take a longer ride, like to or from the airport, it is always good advice to insist on using the taxi meter. The rate for the normal (green) taxis is ¥6 for the first 2 kilometer and then ¥1.5 for every additional kilometer. Waiting times longer than 2 minutes will be charged ¥1.5 per minute. After 11:00 PM the starting price is ¥7. At the airport and around some of the big hotels you might also find black taxis. They charge ¥2.4 per kilometer, but are more spacious and comfortable. There is a road fee of ¥10 for the Airport Expressway. This is not included in the price the taxi meter shows. So going to or coming from the airport is usually ¥10 more than what the meter shows. 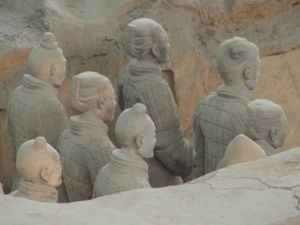 Be careful when taking a cab to areas outside Xi'an proper, such as the Terracotta Warriors. Scamming taxi drivers will pretend that the road is "apparently under maintenance and only the local cabs know the rest of the road to the Terracotta Warriors." Don't believe them, and don't pay anyone anything until you are sure you are at your destination. (You can recognize the Terracotta Warriors site by how well it's built up, after passing through less built-up areas.) Be careful to reject stops you didn't request as the cab drivers earn a commission from bringing you such places. Thus, it is generally much safer and reliable to take the buses if you want to travel to the Terracotta Warriors. Fortunately Xi'an's main sites (with the notable exception of the Terracotta Warriors) are bunched fairly close together. Be wary of the narrow streets and cars that squeeze you out of the way. Bike lanes are available on some streets, however, places to lock bikes, typically are not. City Wall of Xi'an (西安城墙; Xīānchéngqiáng), . As the world's largest city wall, the Xi'an city wall has been restored and is 12m high, 18m wide is its base, 15m wide on the top, 13.7km long, and bikes (also bikes for two or three persons) are provided for renting, now it's ￥45 per 120 minutes/bike (or ￥90 for 120/2-person-bike) plus a refundable deposit. You can hire one at the top of all gates; you may return it to other stations on the wall. Be aware that bikes will not be rented if there is any chance of rain, because the top of the wall becomes slippery. Check the weather forecast before you buy a ticket to enter the wall. If you want to foot it though, a complete loop of the walls takes 4-5 hours. The landscaped park around the base of the exterior walls and moat also makes for a pleasant stroll and gives a different perspective on the battlements and towers. The wall is lit up at night and makes for a pleasant stroll. The present city wall was built in the Ming dynasty(A.D.1368-A.D.1644) on the foundation of the Chang'an Imperial city wall of Tang dynasty(A.D.618-A.D.907). The Xi'an City Wall International Marathon is held each year in Nov. since 1993, running on top of the wall, athletes from amore than 50 countries and regions have participated in the competition during the last 16 sessions. Forest of Steles (碑林; Xīānbēilín), (Just inside the southern city wall, near the Wenchang Gate). 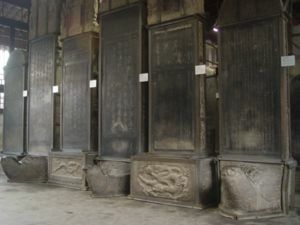 This collection of 2,300 stone tablets (many written to provide an "official text" of the Chinese classics) and epitaphs is the largest and oldest of its kind in China. Army of Terracotta Warriors and Horses (兵马俑) (Bīngmăyŏng), 20km east of town, 2km west of the Qinshihuang Mausoleum ¥150, students with chinese student card ¥75 (includes access to the Qin ShiHuang Mausoleum) (Take bus 306 (7¥) 914 (8¥) or 915 (8¥) from the main train station at the north east corner of the old city wall (not the fast train station further north). These are very frequent, eg the 914 runs every 4 minutes and is clearly labelled on the side of the bus in English. Journey time is approximately 80 minutes. If you arrive from the airport, you can take the airport bus (26¥) for the train station. (Prices as of January 2014)). High Season hours (March 16th – November 14th): 8:30 – 17:30. Low Season hours (November 15th – March 15th): 8:30 – 17:00.
the No. 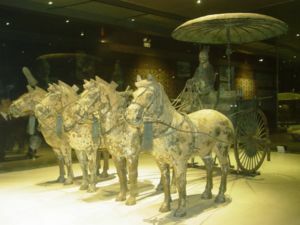 bronze chariot earthed from the terracotta warriors and horses excavation site. This mighty army of terracotta warriors and horses, found in three vaults, is perhaps the most popular tourist attraction of Shaanxi and one of the most popular in all of China, with over 2 million visitors per year. An in-site museum has been built over the three excavated pits, covering a floorspace of 20,000 square meters and displaying 2,000 life-like terracotta warriors (there are believed to be around 8,000 in total), 100 or so chariots, and 30,000 weapons. The assemblage has been billed by the tourist industry as the Eighth Wonder of the World and a world cultural heritage site by UNESCO in 1987.
terracotta warriors have their personal hairstyles. Huaqing Palace (华清宫) (Huáqīnggōng), 6.8 km west of the Terracotta Warriors (bus 306,914,915, the same way to Army of Terracotta Warriors and Horses, 2 stops away from it), ☎ +86 18302976580 ([email protected]), . 8:00AM-6:00PM. Built by the Tang emperor Xuanzong near hot springs at the foot of Li Shan in Lintong County so he could frolic with his favoured Imperial Lady Yang to his heart's content. East to the museum of Imperial bath pool of Tang dynasty, it is the site of the Xi'an Incident, you can see Chiang Kai-shek's old residence. You can also climb the mountain li or take the nearby cable car (60 yuan return) to catch a Birdseye view of the area. It is possible to take hot baths inside, it takes you ¥200. Taiping National Park (太平国家公园), (44 km SW of Xi'an, N slope of Qinling Mountain). Xiangyu Forest Park (祥峪森林公园), (37 km S of Xi'an, N slope of Qinling Mountain). Native English speakers can easily find jobs teaching English to children and adults, in schools and businesses, part-time and full-time. Xi'an souvenirs include small copies of terracotta warriors, wood-carved Buddhas and dragons, Tang Tricolored Pottery, hand made paper cut (by many regarded as the most important arts form in Xi'an), all other kind of folk art and also fake western products. Xi'an is a great place to buy clothes. Foreign Language Bookstore 外文书店 The best place to hunt down an English language novel or book is the Foreign Language Bookstore. Almost every major city in China has one these days, but don't expect to be overwhelmed by the fabulous selection of English books – whether in Xi'an or in any city in China. Expect to find a handful of popular novels and classic prose. You'll also find bucket loads of English language text books and dictionaries for studying purposes. Add: 349 Dong Dajie, Xincheng District, Xi'an 地址：西安市新城区东大街349号 Tel: 029 8721 9872? Jiahui Hantang Book City 嘉汇汉唐书城 The largest bookstore in Xi'an, Book City has a fairly decent selection of imported English books. You'll find a wide range of books here, from educational ones, to classic novels, and modern literature to children's books. The place gets swamped with people at the weekends, so for a more pleasant browsing experience, come during a weekday. Xi'an Book Building 西安图书大厦 Another place worth checking out is the Xi'an Book Building, four floors of books as far as the eye can see. Though the vast majority of books are in the Chinese language, you will find a small selection of English books on the second floor. The building also houses a small audio and video section, as well as a café. Bell Tower Xinhua Bookstore 钟楼新华书店 Another very small English language book selection can be found at the Bell Tower Xinhua Bookstore. Unless you're nearby, your best bet for English books is still the Foreign Language Bookstore or even the Book City. However, if you're also looking for stationary, cards, wrapping paper etc. then it may be worth checking out and to trying to kill two birds with the one stone. Otherwise don't expect an English-language book Mecca here. Yang Rou Pao Mo （羊肉泡馍） is one of the signature dishes of the area: it consists of a piece of thick, chewy bread and a kettle of mutton soup. The diner shreds the bread with his hands and places the shreds in a bowl, the soup is then poured over the shreds (along with meat, maybe some noodles or scallion, etc.) The trick is to shred the bread into pieces that are "as small as possible". Most first-timers will shred their bread in pieces that are too large. In some restaurants, they have already shredded the bread for you. It is normally also served with pickled garlic and chili. If you don't like mutton, some restaurants also offer a beef (niu rou) version. Tong Sheng Xiang Restaurant and the Lao Mi Jia are recommended. Biang Biang Mian is a local specialty noodle dish that is extremely good. The wide noodles are spiced, have a broth, and include toppings such as eggs, tomatoes, beef, etc. The character for "biang" isn't yet possible to type into a computer, but look for a complex character with about 57 strokes repeated twice before "面". A popular chain has a red sign with white characters, and includes the face of the "Noodle King". Rou Jia Mo 肉夹馍 is the closest thing to a hamburger. This is a local tradition and should be very easy to locate. Sandwich-like, with pork, beef or lamb, this is a must-try item for anyone who is in this area. Xiao long bao-zi 小笼包子 are basket-steamed dumplings (one basket ¥3), common as a midnight snack. Look for its big brother "Da bao-zi" only available first thing in the mornings, like a steamed cornish pastie, but very nice. Guan Tang bao-zi 灌汤包子 are steamed buns served with sauces inside. Shi Zi Bing 柿子饼 are buns made from persimmons, stuffed with something (e.g. black sesame paste), and deep-fried, so they're quite sticky-sweet. You can find many sellers in the Muslim Quarter, and they are only ¥1 each! Lu dou gao 绿豆糕 are literally green bean cakes (come in small cubes), but they're more moist than you may find elsewhere and also come with a variety of mixings (e.g. sesame). Half a Jin should be about six cubes and cost about ¥5 at a cart in the Muslim Quarter. Liang pi 凉皮/米皮/面皮 are essentially the same. It's a kind of noodle steamed from ground rice (although it can be prepared from "washed" flour) with a little bit of vegetable toppings typically bean sprouts and sliced carrots. This dish usually goes with Cai dou fu --- a kind of rice soup with tofu in it. This dish comes from Hanzhou, an ancient and beautiful city south to Xi'an, and is considered a healthy diet. The Muslim Quarter close to the Drum Tower is a vibrant area with many restaurants spilling out onto the street and mixing with the street sellers. If you're looking for snacks, this area is also full of people selling dried fruit (especially dates) and nuts/seeds (sunflower, melon, pumpkin, etc.) Prices are per Jin (500 g) and are pretty much standardized throughout the area, so you can't really bargain unless you're buying a lot. Watch out for the pits in the jujube! Street food (mostly sold after sunset, or some near night clubs/bars after 11:00 PM) presents a variety of local/regional dishes, ranging from noodle soups, dumplings, hot pot, and so on by tens of little food vendors on street side, each with a red lamp. There are a few roads running perpendicular to the Muslim Quarter road that have a larger variety of streetside food (at cheaper prices because these roads are harder to access). As streetside stores are nearly a model of perfect competition, look out for food sold at significantly higher prices, yet maintain a long queue as these are likely to be tastier. For instance, some vendors may unscrupulously sell beef mixed with lamb and pass the meat off as pure lamb meat to cut their cost, however those who sell real lamb meat usually charge a higher price. A good way if you do not want the expensive hotel food or just want to try real Chinese cuisine, is to simply go into a small restaurant and point to a dish somebody else is having and you will get a meal for less than ¥10 (seldom ¥20) per person. A good street for eating is Xiyang Shi running east-west near the mosque in the Muslim quarter. However, be warned that the food that is sold may have been exposed to heat and sun for a longer period of time without cooling, so particularly meat, fish or egg products may cause trouble to Western stomachs that are not accustomed to this. McDonalds, Pizza Hut, KFC or its Chinese brother, Dicos, are widely available within city walls for a change from the daily Chinese cuisine. There are also three Starbucks within a 5-minute walk of the Bell Tower. Village Cafe (32 Shi Da Lu, opposite of Bank of China). If you miss your burger, this is the place to go. Night clubs in Xi'an are not abundant. All clubs play the same music, a mix of Chinese disco and some pop music. Most people go out between 10PM and 1AM, but clubs are generally open until 4AM. Be mentally prepared to be aggressively approached by club operators desperate for patrons. In summer time, the area around South Gate (南门) is beautiful. East of it are three nice bars with terraces and gardens. Along the short Nandajie (南大街) are the most clubs (you can also eat on the street as there are restaurants open past midnight). Dance floor, some foreigners and OK-DJs. To get started on a Friday or Saturday night you can have some drinks in one of the bars in "De Fu Xiang" street. There are around 10 bars next to each other. If you are coming in from the south gate, just enter Xiangzimiao street westwards. The street will take a right turn, then you can see the first bars. In case you are heading from the north (Bell Tower), you enter Fenxiang street to the west and turn left into DeFuXiang street (there is a chinese "gate" at the entrance of the street. As with most Chinese cities several cheap run down hotels can be found near the train station. There are a few decent ones inside the city walls on Jiefang Road going directly south from train station. Bargaining is possible especially if you are staying for more than one night. Expect to pay under ¥100 for a single room as getting a room for as low as ¥30 is possible. There are at least six international youth hostels right in the center of the city, easy to find. Booking on the Internet will usually save you money, prices start around ¥15. Xi'an Jiaotong University The best in Shaanxi province, and one of the top universities in China. Chang'an University(长安大学) Directly under the administration of Ministry of Education, Chang'an University is one of the State "211 Project" key development universities. It was merged by the former Xi'an Highway University, Xi'an Engineering Institute and Northwest Institute of Construction Engineering in 2000. 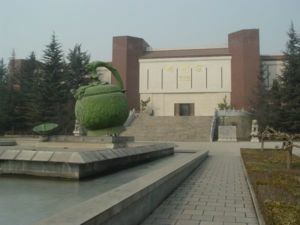 Chang’an University is located in the historical and cultural city of Xi'an and covers nearly 3,000 acres. Many foreign residents are now residing in Xi'an with many of them now calling it home. One organisation which is set up to give information for foreigners arriving in Xi'an as both tourists and workers is 'I love Xian' . There are also publications for expats living in the city such as Xianease magazine and Xi'an Grooves which both disperse regular information about events within the expat community. All of these can be contacted for information in reference to what is currently happening in the city. Xi'an is, like other Chinese cities, generally quite safe. Just watch out for pickpockets in crowds. Pickpockets are more common during holidays. Pickpocketing is more likely to happen on the bus, in the East Street (the most properous commercial street in Xi'an), and some of the more crowded resorts like the North Square of the Giant wild goose pagoda where there is a fountain show every night. Keep an eye on your camera, and basically all stuff you don't want to lose. There are also a lot of people asking for your money and beggars. Look at the Beijing#Cope notes as they apply to Xi'an, too. The air quality here is better than most Chinese cities during spring, summer and autumn, but winter in the region can be dusty and high pollution. Most importantly, take paper tissue with you to toilets. Generally, Western style accommodation will have western toilets, whereas the very inexpensive guest house (zhao dai suo) will usually have squat toilets. If you need to use western toilets, learn to plan your day accordingly. Major tourist attractions will have western toilets. It is a good idea to leave your bags at the left luggage office and then go into town to look for accommodation. This way you will not be overwhelmed by the burden of carrying your heavy bags or luggage around. 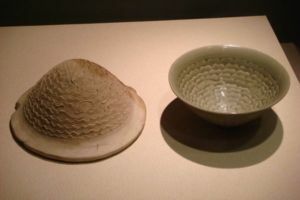 Chen Lu Pottery. 2.5-3hours drive north of Xi'an, this community of potters has been producing pottery since the Tang dynasty and is well worth the look if pottery is your thing, private transportation recommended. Winter is not a good time to visit here due to its location in the deep mountain, if there's a snow fall the icy snow covered road makes trouble. 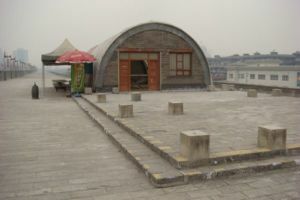 The Yaozhouyao Kiln Museum locates on the way from Xi'an to Chenlu Town, about 90km north of Xi'an, on the western side of the older road, not the high way. 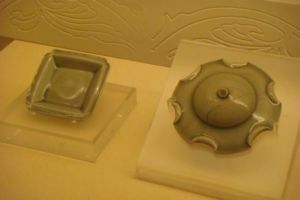 Articles here in 9 exhibition halls depicts the development of the Yaozhou procelain, which reaches its highest level during the Song Dynasty(960A.D.-1279), ranked first in Northern China for its beautiful celadon porcelain. The excavation sites of the original kiln lies 500m north of the museum, you could walk there, which is also well preserved. Hu Kou Waterfall (壶口瀑布 Húkǒu Pùbù). 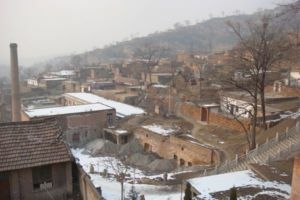 Located 150 km north of Xi'an, private transportation recommended; can be combined with a day trip to Huang Di Mausoleum. If arriving by public transportation, take note that as of 2008 there was only one bus returning to Xi'an from the waterfall. It departs around 10AM and must be flagged down as it does not stop. Huashan National Park. Approximately 2 hours by train or bus east of Xi'an. Huashan is a 2000 metre mountain with spectacular views. It is possible to take the 2-3 hour (6 km) walk up or take the 10 minute cable car for ¥70. Though the cable car often has lines lasting 2 hours. It is best to go for sun rise on the East peak. Take plenty of warm clothing for when the sun goes down. Basic accommodation is available, but can be quite pricey. Guesthouses with dormitory style lodging are available on the mountain. The Daqin Pagoda (Mandarin Chinese: 大秦塔 Pinyin: Dàqíntă "Roman tower" 大秦寺 Pinyin: Dàqínsì "Roman temple"), the oldest known church building in China, is approximately 62 km west-southwest from Xian city centre. It's in Zhouzhi county (周至县 zhouzhi xian) and close to Tayu village (塔峪村 tayucun), approximately 1.5 km West of Louguantai Daoist temple (楼观台寺）. The coordinates are approximately 34 03'32.92" N 108 18'26.19" E.. It was built in 635 AD by Nestorian (Assyrian Church of the East) Christian missionaries who had come from Persia through Central Asia, Xinjiang and Gansu provinces via the silk road to Chang'an (modern day Xian, Shaanxi province) during the Tang dynasty. 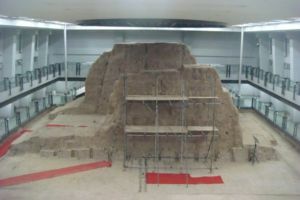 The site includes a replica of the Nestorian Steele, the original of which has been moved to the Xian Beilin Museum (The Forest of Steeles) and the site also includes a small exhibition room with information about the pagoda's Christian history and some information about Nestorian Christianity in China. The pagoda fell out of use as a Christian building after several centuries, as Nestorian Christianity lost adherents in China, and after some time was taken over by Buddhists. Today it is used by Buddhist monks as a monastery and a Buddhist shrine / temple. Half of the premises around the pagoda is used by the Buddhist monks and the other half is made up of historical monuments to Nestorian Christianity. Unless you make special arrangements before going there, you may only be able to see the bottom floor of the pagoda, which is now filled with an array of Buddhist statues. There are several floors in the pagoda which could only be reached with ladders or other climbing equipment. These floors contain paintings and sculptures depicting various Christian scenes. The exhibition room may also be locked unless you check beforehand. To get there, go to Xian City Bus Station (西安汽车站）, also known as the Xi'an Long-distance bus station （市长途汽车站） or Shuisi bus station（水司汽车站） just outside the city wall on the southwest edge of city. It is close to the corner of Fengqing road (丰庆路） and the Western Ring road （城西路）. The entrance is in a smaller side street called Jiejiacun road (解家村路）, which is about 300 metres west from the Fengqing lu / Western ring road intersection. At this bus station take the bus which is going to Louguan （楼观）. Buses are quite frequent and the last buses for the day are around 5:30-6:00pm to and from Louguan. Some buses take 1-2 hours and some take 2-3 hours. The quicker buses go down the expressways the longer ones drive through the countryside through many small villages stopping frequently to let passengers on and off, before finally arriving at the carpark of Louguantai (楼观台） which is a famous Daoist temple complex. You can confirm with the driver that you are going to the Louguantai carpark; if you can't speak Chinese, show him the Chinese characters. When you arrive at the carpark you should be at the corner of 108 Provincial road (S108 or 108 Sheng Dao) and 220 County road (220 Xian Dao). At this corner there will likely be some taxis waiting nearby some people selling snacks and refreshments. You should also see a small police station opposite this corner, next to a small supermarket. Ask one of the local taxi drivers to show you the way. You may have to negotiate a price without using the meter. The pagoda is approximately 2 km south west of this corner. The taxi driver should drive about 1 kilometre westwards on the S108, then turn left into tayucun road (塔峪村路). He should drive up the hill, and pass 2 or 3 bunches of small houses, before driving up a dirt (or mud) road before stopping. From here you will have to hike up the hill, which takes about 10 mins through some muddy footpaths past some corn fields and up onto the side of the hill where you will find the pagoda. Pingyao Ancient Town: Also a walled city, but in smaller scale. Very touristy, specially during the high season. Approximately 7-8 hours by bus which departs at 9:30AM from the bus station inside the wall directly south of the main railway station. This bus will not go into Pingyao but instead drop passengers of at the toll gate exiting the expressway. From there it is around 3km into the town, which you can wait for another bus (may take over an hour) or negotiate with drivers (non-marked taxis) that will be waiting there - they will start at 30 RMB but haggle given the short distan. There are also overnight trains heading to Pingyao from Xian - book ahead as they will get booked quickly. This page was last edited on 15 April 2019, at 01:51.